A healthy garden vegetable lasagna, with layers of spinach ricotta, zucchini and onions, noodles, marinara sauce, and mozzarella cheese. A delicious vegetarian lasagna that freezes wonderfully, so make a double batch and freeze another one for later! I get so happy going out and looking at my garden. We spent the spring grading our hill and building six 4″ x 8″ raised beds. 2 whole beds are dedicated to arugula and lettuce, and we’ve been having lots of salads using them up. Now that it is getting warm out, we are starting to see our first tomatoes and zucchini coming in. We have 8 tomato plants, 3 zucchini plants and 2 yellow squash plants. For just the 2 of us. I may have gone a little overboard planting. We have a few little baby green tomatoes that are just starting to grow. It has been cloudy and overcast here in California for almost a month, but it is finally getting bright and sunny, so I’m hoping to have some tomatoes to enjoy in just a few weeks. Last week our first zucchini blossoms sprouted up, and this week the little tiny squash are growing. I can’t wait to have more zucchini than I know what to do with. 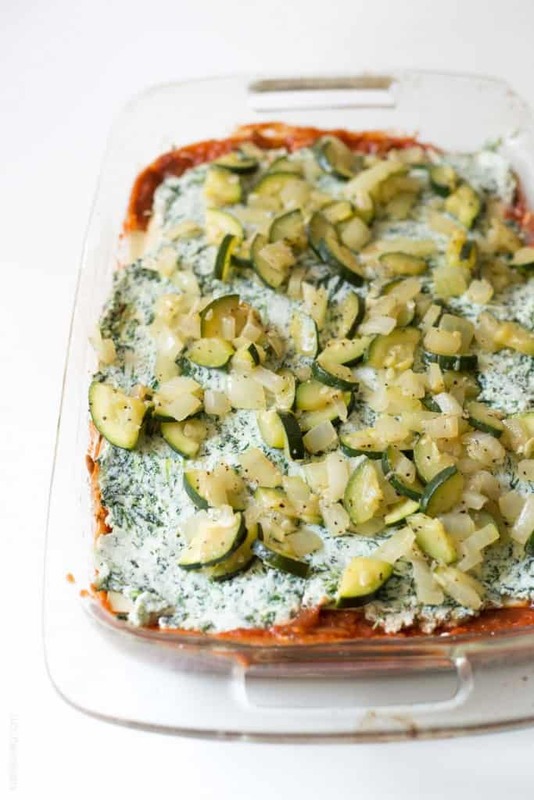 One of my favorite ways to cook up zucchini is in this garden vegetable lasagna. It is my very favorite lasagna recipe. I skip the meat, and instead add in lots of delicious vegetables. I add in lots of spinach to the ricotta, which gives it a beautiful green color. 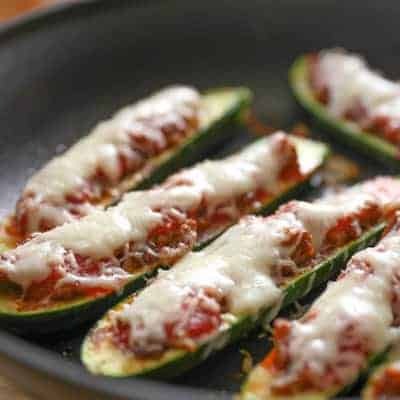 And instead of the typical meat layer, I swap that out for a layer of sautéed zucchini and onions with some garlic. Add in some layers of noodles, mozzarella cheese, and your favorite marinara sauce, and you have yourself a delicious, healthy lasagna. Even though it is just the 2 of us, I still make a big 9×13 garden vegetable lasagna. This will last us 2 dinners, and Shawn will eat a big square of it for lunch all week. 1 meal prep, 2 dinners, and 5 lunches. Can’t beat that! And if you know Shawn, you know that it is the highest compliment to a recipe if he will eat leftovers that many times in a row. That boy likes his variety. 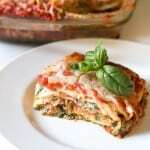 This garden vegetable lasagna freezes beautifully! If I have enough ingredients on hand, I’ll just make a double batch and freeze the other one. If I do that, I’ll make it in one of those disposable aluminum lasagna pans you can buy at the grocery store. That way my glass baking dish isn’t held hostage in the freezer. As soon as I have a ton of zucchini on hand, I know I’ll be whipping up a few batches of these to freeze. Leftovers will keep in an airtight container for 1 week. That’s so exciting that you garden is doing so well, Natalie! I really miss having one and definitely need to plant some veggies next year. 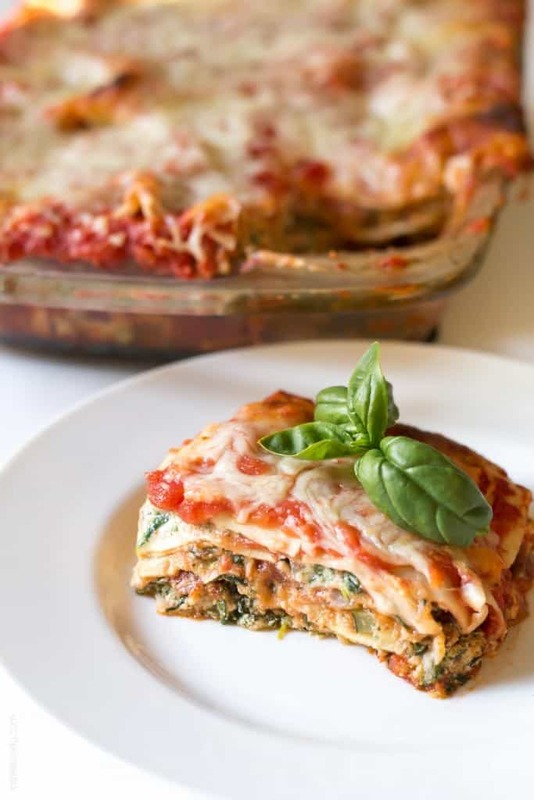 This lasagna looks just perfect! I’ve never actually had one with just veggies before, so I’m loving the fresh flavors! Sounds delicious! I love veggie lasagna! This looks so cheesy and delicious. I can’t wait to see your harvest this summer! I’m getting SO excited for my garden too! Just the other day I saw big ‘ol blossoms on the tomato plants and I literally squealed. LOL. And this lasagna? Oh gosh, I am SUCH a sucker for veggie-filled lasagna! I secretly love it even more than the traditional kind. ;) Lovin’ all the healthy green goodness you loaded into this! Your garden sounds amazing! Love it when you can go out and grab fresh veggies from your backyard :) We aren’t growing as many veggies as last year but the zucchini and tomatoes are always my favorite too. Love your veggie packed lasagna! It looks gorgeous! Ohhh, how exciting that your veggies are coming in, Natalie!! 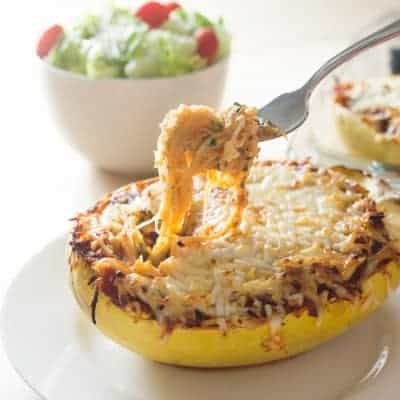 You’ll be on zucchini overload, but how fun! It’s such a versatile veggie. Can’t get more local than your back yard either! Love it! This Lasagna, mmmmm.. comfort food, yes and I will turn on my oven for this! Bonus points for multiple meals and lunches! Thank you, Natalie! Delicious! my mom would love this! looks good! I love lasagnas, but who doesn’t? the vegetable version is always so much lighter and with more flavor, definitely something I would enjoy eating. I am SO jealous of your garden! It must be so great to pick your own vegetables all the time and this lasagna looks so fresh and delicious!! It has been way too long since I made a lasagna and now that is going to have to change. 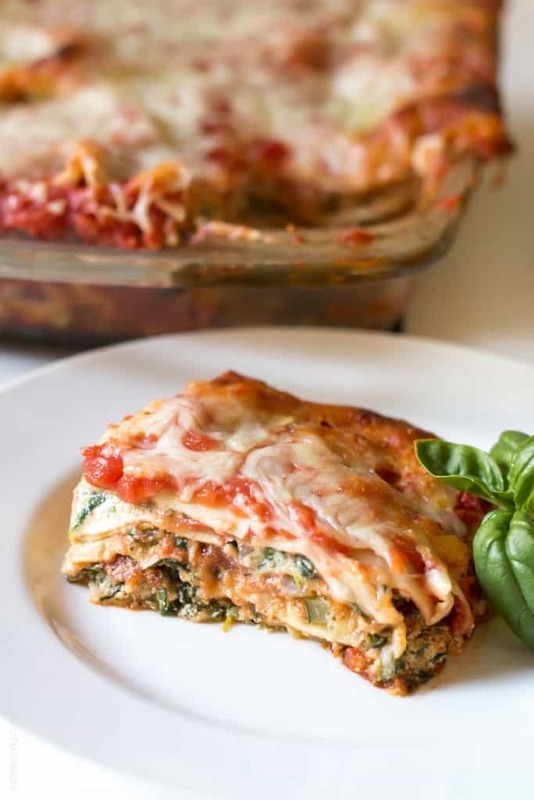 Umm…you can totally send some of your veggies my way–this lasagna looks so amazing! 1. So jealous of your booming garden! 2. 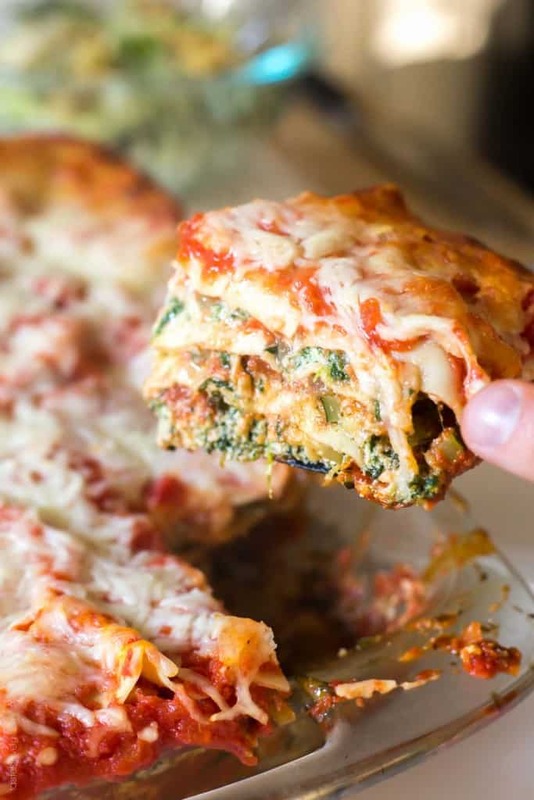 This vegetable lasagna looks amazing – I’d definitely eat it for 5 lunches in a row! I could totally eat lasagna for lunch and dinner all week long. This is so perfect for summer produce! I made this today and it was great! The ricotta spinach layer in particular was amazing. Thanks for the recipe! I am so happy to hear that Emma! Thank you for telling me you just liked my recipe. You just made my day! Hugs! 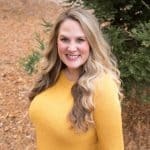 Kristine! You just made my DAY! I’m so glad you and your family liked it. And thanks for taking the time to let me know. Hugs friend! I made it for a potluck. Everybody loved it and asked me for recipe. I added fresh minced ginger and Ancho dried chili. Thank you for an awesome recipe. I am so happy to hear that Indy! This just made my day! And this would be a great dish to bring for a potluck. And now I want to try it with ginger and ancho dried chili. Yum! Thanks for taking the time to let me know you liked my recipe, you’re too nice! Yes why frozen? Does fresh spinach mess it up? To be clear, if I’m freezing this, I put all of the ingredients together as described, but do not bake until I pull it out of the freezer and am ready to eat it right? Also, why frozen spinach instead of fresh? I made this for a Ramadan gathering the other day and it was perfect! Followed the recipe exactly and it was so tasty. Thank you for sharing! I’m so glad you liked in Amna! This made my day! Thanks for letting me know! I love this recipe. I used fresh spinach and cut it up and put it in the ricotta mix. I also grated the zucchini so it would be finer! Turned out great!!!! The family loves it. I’m so glad you liked it Kaila! And so smart using fresh spinach! Do you put it in raw? Or cook it first? I want to try that next time! Can regular boil lasagna noodles be used and if so, would I need to cut down on the marinara or other liquids? Also, can it be put together, frozen, thawed in fridge then heated? I would like to try to make it ahead for Christmas. Yes! You can use boil lasagna noodles! No need to adjust the amount of marinara. Yes! This freezes beautifully. Assemble it, then freeze it RAW. Take it out 24 hours before to thaw in your fridge, then bake it according to the directions. This is a great one for Christmas! Your whole family would love it. 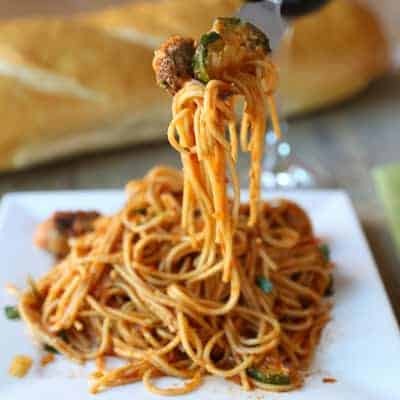 I love making it for my family since my mom and sister are vegetarian, and this is a dish all can enjoy.